Are there any Escape/Memories brides on here who did a small "reception" after the ceremony at a restaurant on property? We were thinking of a post-ceremony dinner at California Grill, which we LOVE...but I was not sure how that worked. Can we wear our wedding attire? Hi - we are looking at going to the Yachtsman after our dinner (yacht club). 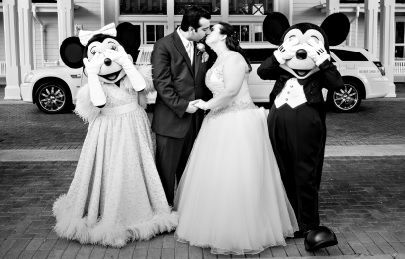 As long as it's NOT in a park you can wear your wedding attire; so California Grill would be safe to wear your dress (so any resort and DTD you can wear your gown). The only gotcha is you cannot use Disney 'Public' Transportation in your wedding clothes, so you can get one way town cars, vans, a taxi, etc. Thank you so much. I see your ceremony is at Sea Breeze Point...we had our original ceremony there and it is beautiful! I can't wait to hear about your wedding - it is coming up quickly! We are getting married June 2015 on DCL Dream. The downside to getting married on DCL, is you get no real reception. So we are looking at booking The Napa Room at California Grill for a land reception after our DCL wedding. It is a nice sized private room with a view of Wishes fireworks from the room. I know the menu is limited to what they prepare at California Grill but that is fine with us since the food is yummy. I hope to wear my wedding dress too. We have contacted sales and hope to hear back next week. Fingers crossed it will be available. I am doing a wishes wedding in Aug with my reception at Napa Room. I agree about the limited menu but have heard great things! We are also planning to have our wedding dinner at the California Grill! Our budget is really tight, so we aren't booking anything private-- just a reservation for our group of 11 (me, fiance and immediate family members). They've been great to deal with over the phone so far, super helpful! Hi there! Congratulations to all of you on your upcoming weddings! I'm new to the forums and I have just started the planning process. We are looking at doing our dinner reception at the Napa room but I haven't been able to find any sample menu's online. Do any of you have any links? Thanks! Does anyone know how many ppl you can make a dinner reservation for at a California Grill without having to get a private room? We have 12ppl and really wanted to do a post ceremony dinner there!